At our clinic we offer an innovative approach to Physical Therapy, Strength and Conditioning and Sports Enhancement to all levels of fitness. These treatment protocols – over 500 specific moves – are unique to ART. They allow providers to identify and correct the specific problems that are affecting each individual patient. ART is not a cookie-cutter approach. 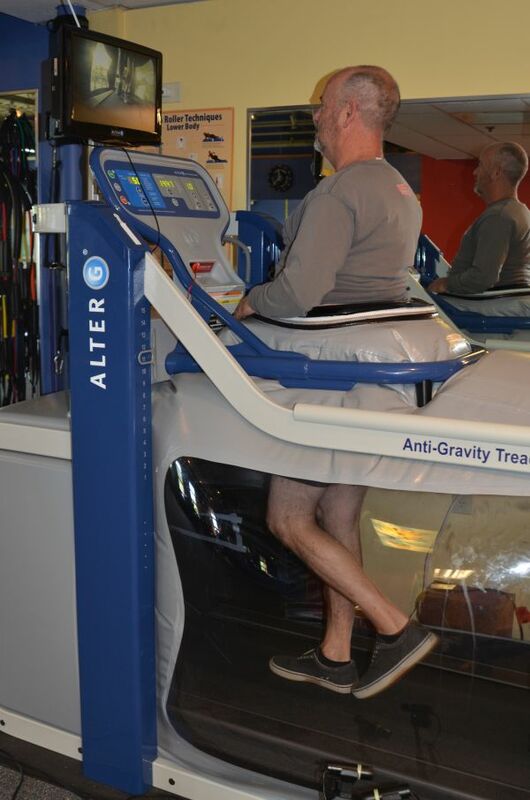 We utilize a state of the art Anti-Gravity Treadmill called the Alter G. The Alter G is the first FDA cleared therapeutic device that allows for precise partial weight-bearing exercise. It was first developed using NASA technology for exercise programs in training astronauts. AlterG uses differential air pressure chambers to precisely lift the user from 100% to as little as 20% of the user’s calibrated body weight. Reduction in body weight can occur in 1% increments allowing for a gradual progression to full weight-bearing activities. 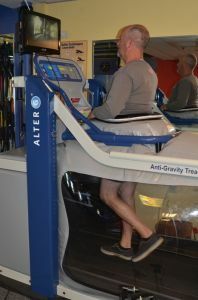 Experience the Alter G difference for yourself and see why over 20 NCAA teams, over 20 professional sports teams and over 60 top performance enhancement centers, medical facilities and government facilities are using the Anti-Gravity Treadmill in their training and rehabilitation programs. 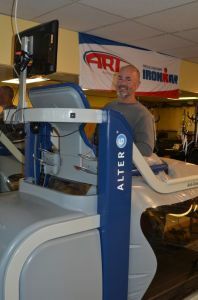 The Alter G is available for use at a number of different time and rental plan options. For a complete breakdown of our pricing, including monthly memberships, 5-visit punch cards, 10-visit punch cards, and per minute punch cards, please call our office at (970) 870-3484 or email Erin Rosso at info@foreverfitsteamboat.com. Additionally, Alter G use may be covered under your insurance policy as part of your rehabilitation plan. If you would like to use your insurance for use on the unit, please inquire and we will check whether coverage applies. Stay on the field, on the job and in the game with Move2Perform. Move2Perform is a movement measurement and analysis tool that identifies deficits and the probability of losing time from your ac­ tivity. It provides objective reporting for pre-season screening, return to sport testing, occupational testing, and general population wellness examinations. Move2Perform products have been studied with overwhelmingly positive results, published in peer-reviewed literature and adopted by the mili­ tary and professional sports teams internationally. The FMS generates the Functional Movement Screen Score, which is used to identify imbalances and asymmetries in your movement pattern which can predispose you to injury. This scoring system is directly linked to the most beneficial corrective exercises to restore mechanically sound movement patterns. The Functional Movement Screen (FMS) is the product of an exercise philosophy known as Functional Movement Systems. This exercise philosophy and corresponding set of resources are based on sound science, years of innovation and current research. The Functional Movement screen can add to your personal performance or be utilized as a tool in decreasing work site injuries. The FMS simplifies the concept of movement and its impact on the body. Its streamlined system has benefits for everyone involved – individuals, exercise professionals, and physicians. Communication – The FMS utilizes simple language, making it easy for individuals, exercise professionals, and physicians to communicate clearly about progress and treatment. Evaluation – The screen effortlessly identifies asymmetries and limitations, diminishing the need for extensive testing and analysis. Standardization – The FMS creates a functional baseline to mark progress and provides a means to measure performance. Safety – The FMS quickly identifies dysfunctional movement patterns so that they can be addressed. It also indicates an individual’s readiness to perform exercise so that realistic goals can be set and achieved. Corrective Strategies – The FMS can be applied at any fitness level, simplifying corrective strategies of a wide array of movement issues. It identifies specific exercises based on individual FMS scores to instantly create customized treatment plans. Put simply, the FMS is a grading system that documents movement patterns that are key to normal function. By screening these patterns, the FMS readily identifies functional limitations and asymmetries. These are issues that can reduce the effects of functional training and physical conditioning and distort body awareness. The FMS generates the Functional Movement Screen Score, which is used to target problems and track progress. This scoring system is directly linked to the most beneficial corrective exercises to restore mechanically sound movement patterns. Our Facility offers all the equipment to meet your needs.